Eagle’s Nest is a deep, 94m (310ft) sink cave in Florida, USA. To date, 11 divers have died exploring Eagles Nest. The Christmas Day fatal dive by the father and son made international headlines. The father was not a diving instructor, the son had no scuba training, and neither of them had cave diving training. Closing Eagles Nest will not make it safer, because people are likely to break into this site to dive it. Earlier this year, in February, the Florida Fish and Wildlife Conservation Commission (FWC) convened a meeting to discuss maintaining access to Eagles Nest, and other sites on the Chassahowitzka WMA tract (Buford, etc). Representatives of the NSS-CDS (TJ Mueller, Ken Sallot, Jonathan Bernot), Karst Underwater Research (Brett Hemphill, Matt Vinzant), IANTD, PADI, SDI / TDI, DAN, NACD (Rick Murcar), and the IUCRR (Ken Hill) attended this meeting. 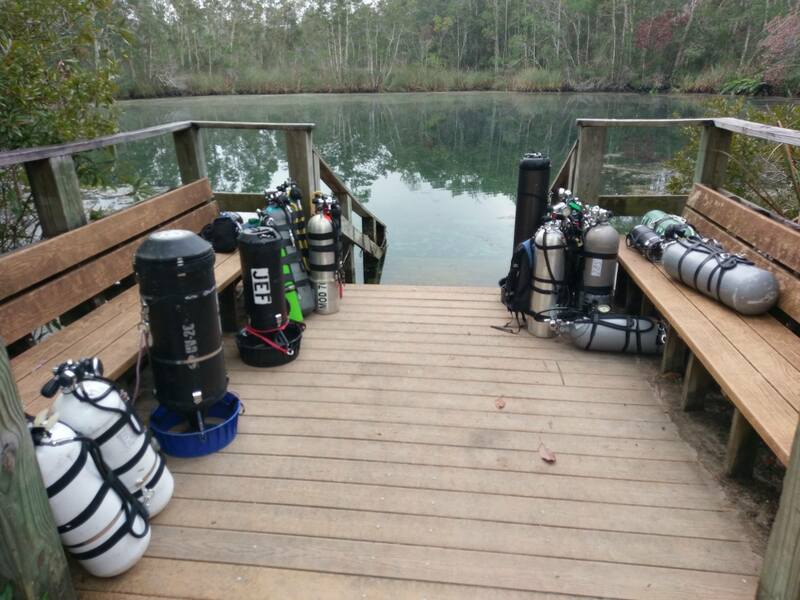 Ken Sallot advised that during the meeting attendees were asked to suggest new guidelines that would allow qualified divers to continue to enjoy the sites on WMA property. The attendees recommended that Eagles Nest is considered an advanced deep cave site, and therefore should only be dived by those with proper training and experience. The meeting was convened because there has been some lobbying to close Eagles Nest because of the cave diving deaths. Closing the site will not make the site any safer, and in fact, it could make it more dangerous because untrained people will break in to dive the site. There are plenty of warning signs above and below water yet Spivey Snr and Jnr ignored these signs and died. Let's compare closing Eagles Nest down with an every day scenario. No one has sought to lobby to close Interstate 95, yet the 382 mile stretch of highway through Florida is one of the most dangerous road in the United States. It has a high rate of fatal accidents. Between 2004 and 2008, there were 1.73 fatal accidents per mile in Florida. If the authorities took the decision that this road is obviously dangerous and ought to be closed, the general public would consider this to be a bonkers decision. The same thinking ought to be applied to Eagles Nest. Several safe dives are conducted on this site each year. Cave divers in the main are responsible and disciplined. They take their sport very seriously and respect site access. They plan, they are properly equipped, and they are trained. Ken Sallot has now reported that earlier this week the FWC Commission approved a major rule change to the Chassahowitzka WMA. As part of the change, divers will need to complete a no-cost electronic registration that acknowledges that the diver is aware of the risks involved in diving a deep cave system, and that they need to have the appropriate training and experience to dive the site. It is believed that it will take several months before the electronic registration system is in place, but this no-cost simple registration will allow qualified individuals to continue to enjoy diving at Eagles Nest. It is worth pointing out that access to cave systems can often be tricky. Thanks to the combined effort and cooperation of the training agencies and organisations mentioned above, it looks as though access to Eagles Nest will be maintained. The majority of these fatalities involved divers who did not have a Full Cave certification, nor a Trimix ticket and appropriate experience with deep cave dives. John Robinson (36) of St. Petersburg and Craig Simon (44) of Spring Hill were experienced cave divers. Robinson had been certified to dive caves for a decade. Simon for about two years. Robinson used a scooter to get deep into the cave. At some point, a silt out happened, causing them to lose the guideline out of the cave. Robinson dropped his scooter, and when he found the line, he continued down the line, presumably thinking he was exiting. In reality, he was headed deeper. It is presumed he eventually ran out of air and drowned.